The General Manager and Principal Financial Advisers. Sub: Implementation of recommendations of Seventh Central Pay Commission accepted by the Government - Annual Allowance. 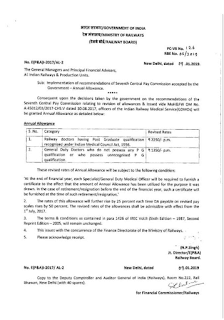 At the end of financial year, each Specialist/General Duty Medial Officer will be required to furnish a certificate to the amount of annual allowance has been utilized for the purpose it was drawn. In the case of retirement/resignation before the end of the financial year, such a certificate will be furnished at the time of such retirement/resignation. 2. The rates of this allowance will further rise by 25 percent each time DA payable on revised pay scale rise by 25 percent. The revised rates of the allowances shall be admissible with effect from the 1st July, 2017. 3. The terms & conditions as contained in para 1426 of IREC Vol. (Sixth Edition - 1987. Second Revised Edition - 2005, will remain unchanged. 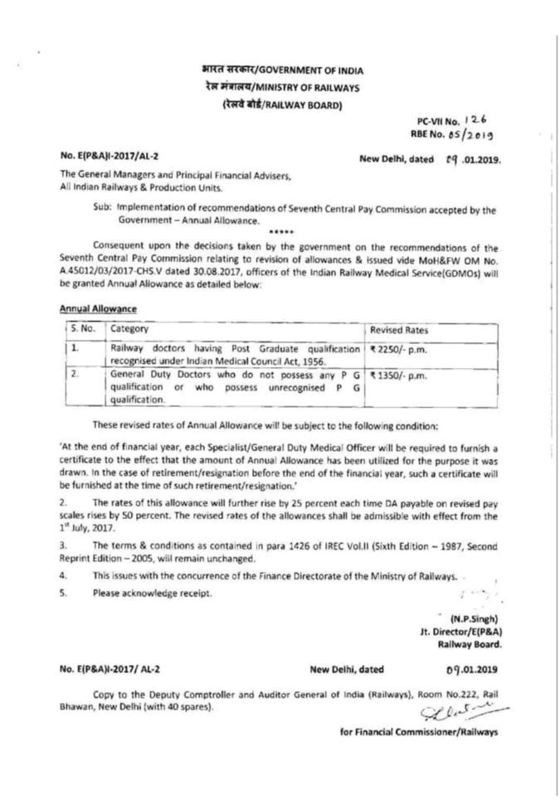 Copy to the Deputy Comptroller and Auditor General of India (Railways). Room No.222. Rail Bahawan, New Delhi (with 40 spares).